Focus On Fracking Diverts Attention From Horizontal Drilling Hydraulic fracturing gets the spotlight, but without another technology — horizontal drilling — natural gas drilling booms across the country would not be happening now. 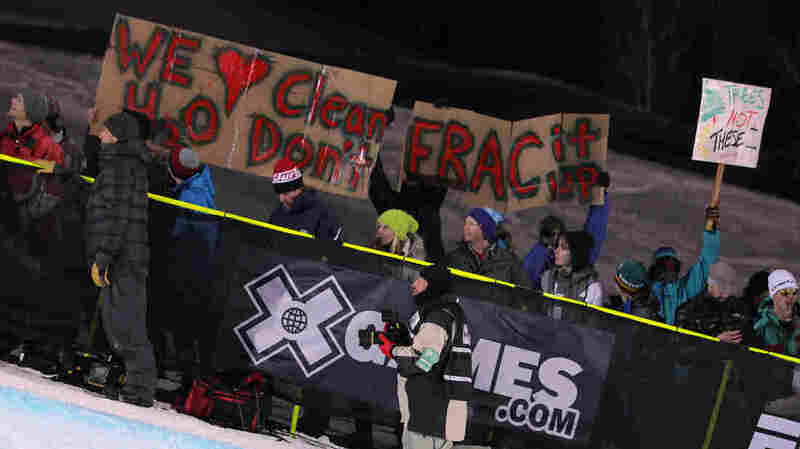 Opponents of fracking demonstrate during the Winter X Games 2012 in Aspen, Colo. Mention the recent surge in oil and natural gas production in the U.S. and one word comes to mind for a lot of people: "fracking." Hydraulic fracturing is a controversial technique that uses water, sand and potentially hazardous chemicals to break up rock deep underground to release oil and natural gas. But there's another technology that is just as responsible for drilling booms happening across the country: horizontal drilling. Horizontal drilling and fracking have been combined in recent years to make previously unprofitable deposits profitable. Much of the oil and natural gas that drillers are after these days is sandwiched deep underground in layers of rock. "A vertical well going through a hundred-foot-thick gas shale, like the Marcellus, contacts that formation for a hundred feet," says Terry Engelder, professor of geosciences at Pennsylvania State University. That means a driller would be able to extract oil or gas from only that 100-foot section. But with horizontal drilling, Engelder says, the drill bit makes a turn and extends the well out — horizontally — through that layer of petroleum-rich shale. Instead of extracting gas from only a 100-foot section, now a driller can extract it from a section that extends a mile or more. Combining both technologies has turned once sleepy communities into industrial zones in states such as North Dakota, Pennsylvania, Ohio and Texas. The environmental consequences spawned a new protest movement. It's showing up in your movie theater in the recent film Promised Land and the 2010 film Gasland. This past summer Yoko Ono and her son, Sean Lennon, sang their fracking protest song "Don't Frack My Mother" on Late Night With Jimmy Fallon. Ono held a globe labeled "Mother Earth" as her son sang about the dangers of fracking, but they never mention horizontal drilling. While you won't hear about horizontal drilling in a song or see it on a bumper sticker, it's just as responsible as fracking for changing rural landscapes. So why all the focus on fracking? Chris Tucker of Energy in Depth, a project of the Independent Petroleum Association of America, suspects the reason fracking has taken off — especially among the industry's opponents — is the word itself. 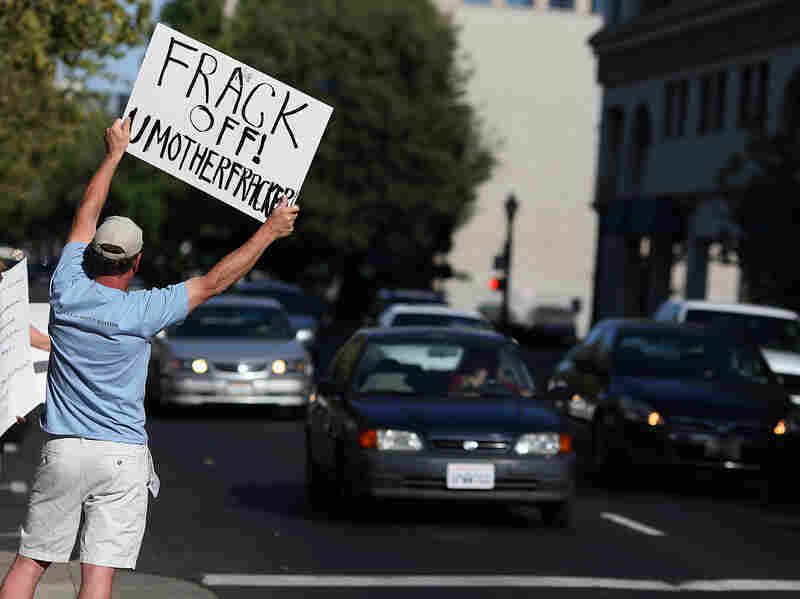 A protestor holds a sign against fracking during a demonstration outside of the California Environmental Protection Agency headquarters on July 25, 2012. This focus on fracking and not horizontal drilling has surprised even some of the petroleum industry's critics. "In our organization we talked about fracking maybe eight years ago," says Bruce Baizel, with Earthworks' Oil and Gas Accountability Project. "I never would have predicted that it would have become the catchall term." Fracking has evolved to mean more than just hydraulic fracturing. Baizel says people now use it to refer to just about anything to do with producing oil and gas. "It means either drilling or ... hydraulic fracturing or it means the truck that ran off the road and spilled whatever the waste was it was hauling away from the well site," Baizel says. Groups like Baizel's that regularly go up against huge oil companies have embraced this expanded definition of fracking. Oil and gas drilling employs complicated technology that can be difficult to explain to the general public. But with one common word — especially one like fracking that just sounds bad — it's easier to rally opposition.